Confidence is a funny thing. I haven’t ridden by myself since Xato bolted with me, back in March. This was a choice, initially, because it seems to me that whenever I do stuff without Ben around things go horribly wrong. It then, insidiously, became a thing I could not do. I didn’t even realise this was the case until last week, when I tried to get on and ride Xato in the arena and just couldn’t bring myself to do it. I hadn’t been able to do any weekday riding for a while as I had no one to ride with, and was desperate to get on board. “Just ride one lap around the arena,” I told myself, “just to say you’ve done it. That’s all.” But I couldn’t. 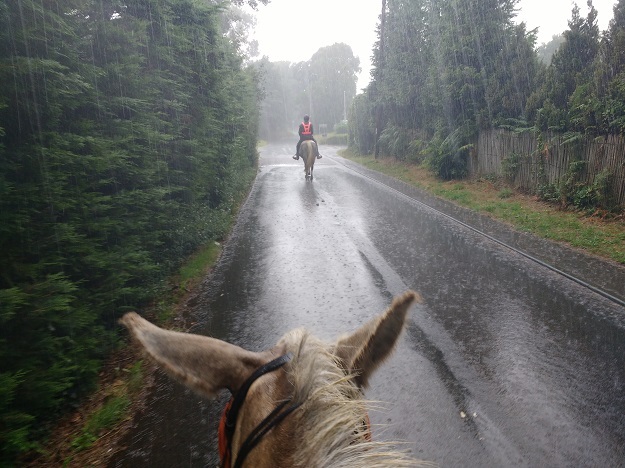 Riding in torrential rain on Saturday; no problem. Riding a circuit of the arena; uh-uh! With this in mind, deciding to conflate my first solo ride since the bolt with mine and Xato’s first solo hack probably seems like a pretty weird thing to do. 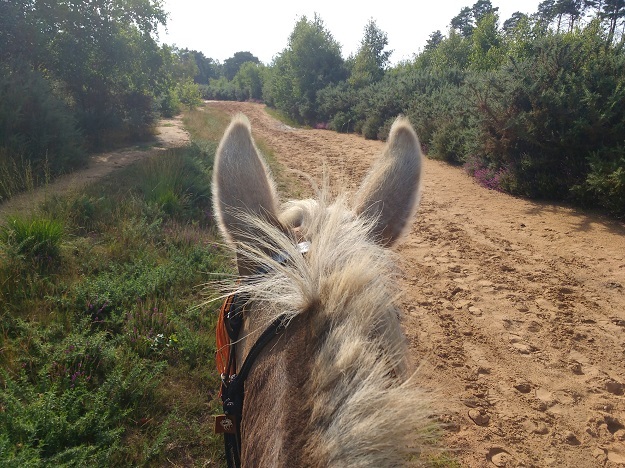 But the thing was, when I thought about riding out I felt confident – I like riding out. It’s exciting. It’s enjoyable. It’s my comfort zone in a way that arena riding isn’t. 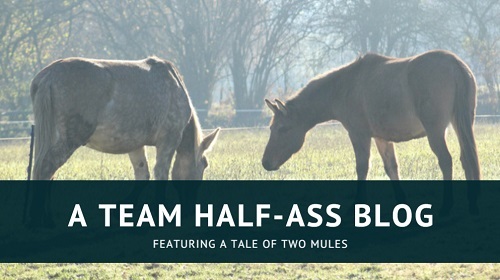 There’s no reasonable explanation for this and it doesn’t make an ounce of sense, but I knew that starting from a confident place meant that the first barrier was over with: if I feel confident, my mule will too. I am terrible at coming up with plans in the arena, but riding out gives me goals to mould and attain; and having goals means that Xato feels like he has a purpose, too, which is another confidence booster. 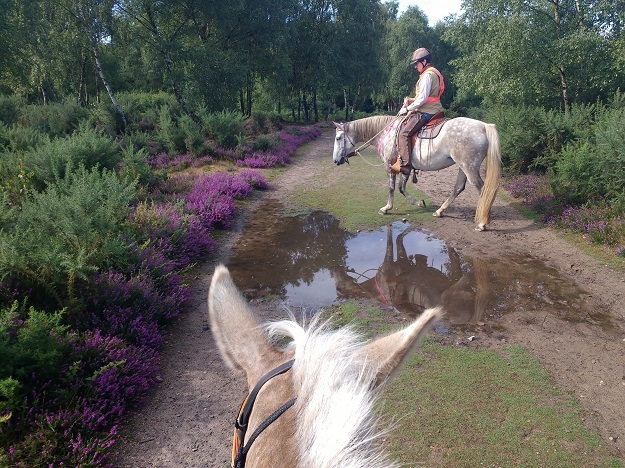 Sunday’s weather was better, and at least the earlier rain and the cooler temperature meant that the woods were horse-fly free. So on Monday morning, I arranged to go out for a ride with another friend of mine who lives further down the lane. This meant that Xato would have to walk down the lane on his own in order to meet up with them. I figured this was an ideal introduction to the concept of riding out alone: he goes a short distance, meets up with a horse, has a ride in company, and then goes home by himself. Unfortunately, the weather forecast lied to me and instead of raining during the first half of the night and being dry by morning, it was dry in the evening and then started raining heavily during the early hours. Of course I hadn’t put a rug on him and I wasn’t able to get him dry in time to ride out, so I had to cancel. 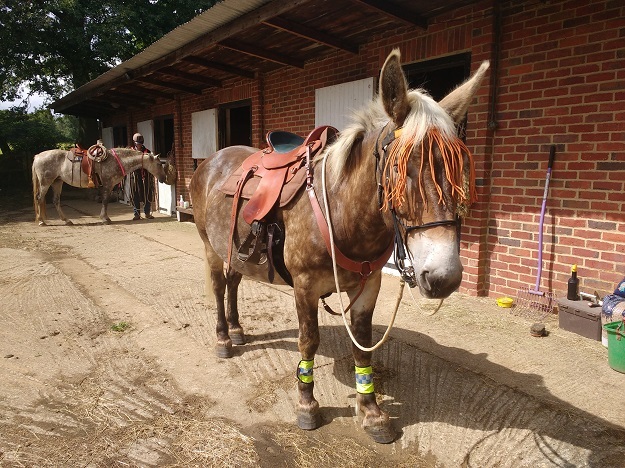 So I went back to the stables, brought Xato in, saddled up and mounted. 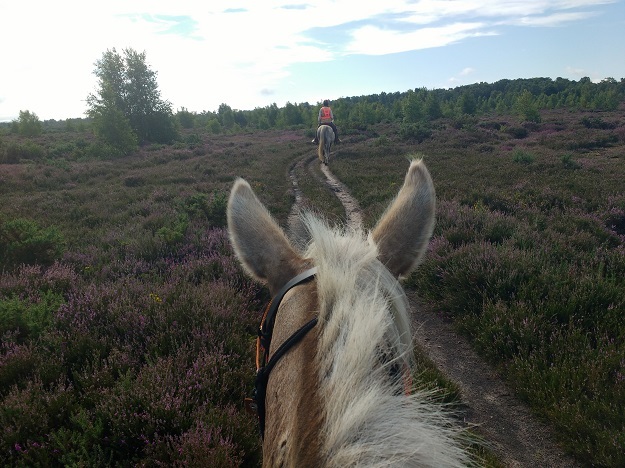 He was a little bit disappointed when he realised that I wasn’t just planning on riding him back to the field – we have to pass it in order to leave – but once he understood what the plan was he stepped out onto the lane quite happily. 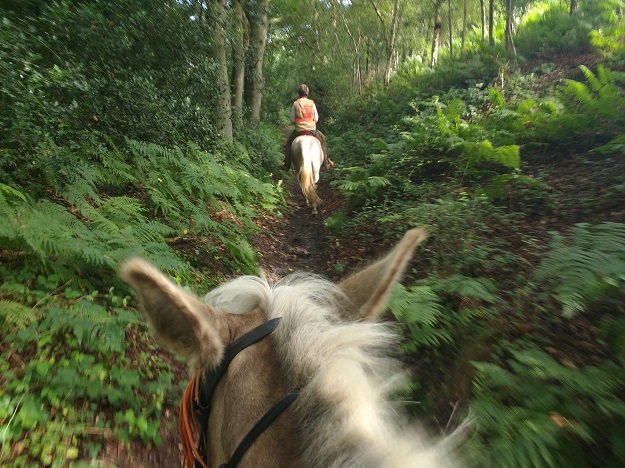 I had decided to ride up the lane, turn around the little “roundabout” at the top – just before it turns into the offroad tracks of the Punchbowl – and then ride home again, a journey of about twenty minutes. The upper part of the lane is much quieter than the lower half, and it seemed to me like this was an ideal, easy route to take that would set us both up for success. Another from Sunday’s ride with Ben. And we were set for success. We really were. He was more alert than usual, but he never once offered to nap or turn back. A tiny nudge with my heels was all that was needed to persuade him whenever that question mark appeared above his head. We hadn’t gone far when I suddenly noticed a cat, poised on the bank to our right. It was completely motionless, frozen in the act of descent. The lane is a hollow way, which means it is a narrow track with very high, very steep banks on either side. When I noticed the cat, it was already eye-level with Xato. Xato, surprisingly, was oblivious. He was looking up towards a gateway on our left, and at a pile of wooden crates that had been left ready on a bonfire. I had a split second to make a decision: stop him, and try and draw his attention to the cat – which might result in a spin and a possible slip on the road – or continue past and hope the cat stayed where it was. I went with the latter. My reasoning was that I would rather have it spook us from behind than from in front, and fortunately it stayed exactly where it was as Xato walked by. Xato is not a spooky mule, but I think any prey animal would be surprised by the sudden appearance of a predator – however small! – right next to their head. He’d only gone a few paces when he stopped dead and stared at the bonfire. I allowed him to look, then asked him to move on. However, he was really concerned by the wooden pallets. There’s a difference in feel between the mind willingly going where you direct it and the mind staying where it is as you move the body; a willing change of thought feels, to me, like a piece of string. I’ll suggest a direction, and the equine will acquiesce: the string will slip free from whatever it is attached to, and the transition is smooth. An unwillingly change feels more like elastic. I asked Xato to move and he began to, but the thought pulled him back. Again, I had to make a quick decision. As far as I knew, the cat was still poised on the bank behind us. Xato was still oblivious. Without the cat, my decision would have been easy: all Xato wanted to do was have a proper look at the thing that was worrying him, and I will absolutely allow him to do so providing that the situation is safe. He wasn’t being ‘naughty’, he was genuinely concerned. I felt that creating enough energy to move him at that point would have just been me becoming scarier than the bonfire, which I did not think would be beneficial in the long term. But what if the cat jumps and scares him from behind while he’s scared of something in front, I thought? Equally, if I have to up my energy and push him forward and the cat jumps, will I then have created a boiling pot of anxiety and made this a terrible experience for him? I chose the first option. And the next thing I knew, I was suddenly three foot lower than I had been. Xato had pushed off with both hindfeet, which I had anticipated, but what I hadn’t imagined would happen was that he would slip and loose his footing. He went straight down onto his belly. I barely had time to appreciate my new perspective of the world when he was up again, and I turned in the saddle to see the damn cat crouched in the middle of the lane; a suitably abashed look on its face. Out loud, I told him: “It is safe. You fell because you slipped and you slipped because you jumped. If we take it slowly, it won’t happen again.” And I nudged, ever so gently once again, with my heels. It was like cresting a wave. There was that moment of suspension, even though he didn’t physically move a muscle, and then down the other side we went as the anxiety drained out of him and he moved off without another thought. The string slipped free. Honestly, I could have cried for love of him at that point. 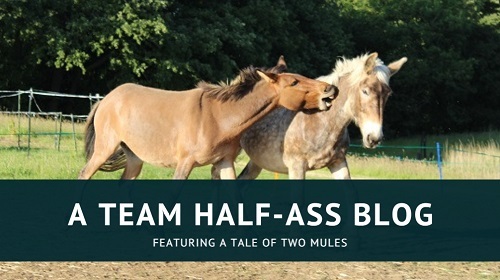 That so-called “stubborn” mule quality – the strong sense of self-preservation – had reared up, and yet he had trusted me. It was an incredibly humbling moment and I’m a little bit teary just writing about it. From our ride on Tuesday. He was walking fine – I rather suspect he deliberately put himself on the floor, as I have seen Marty do exactly the same; when Marty’s hind feet slipped and he couldn’t get purchase, he neatly folded his legs and lay down on his belly to avoid injury. Xato went down a little quicker than that, but I still think he had some intent in there – so I decided to carry on with our original plan. He was foot perfect the rest of the ride. We almost immediately rounded a corner and found someone blowing leaves out onto the road from a blind gateway; I asked Xato to halt, and we waited patiently until the person came into view and was able to see us. We went up to the top of the lane, halted there for a few moments, and then turned for home. He was a little wary as we passed the place he fell, but it seemed to me that he was inspecting the floor rather than looking for the cat or the bonfire; as though he was trying to figure out why that bit of ground had been dangerous and the rest had not. He is so unbearably smart. Anyway, we went back out again the following day. The cancelled ride from Monday morning had been rescheduled to Tuesday afternoon, and I was really looking forward to it. 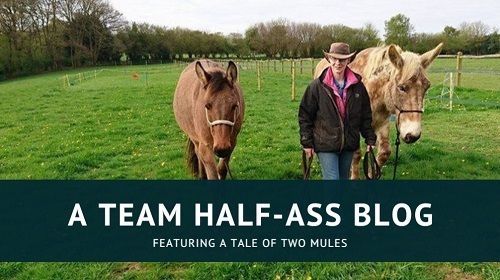 I was surprised at myself for not being a quivering wreck after the fall, as my fear of bolting comes straight from my fear of the horse/mule going down with me on board; but as my lovely friend Fi pointed out, the worst had happened and we had survived. We were fine. Another friend also pointed out that the cat was almost certainly a sabre-tooth tiger in disguise and that Xato had saved my life. He is a big damn hero, but then I already knew that. This is what a good boy looks like. A good boy, indeed! And a smart and cool-headed rider, too! Glad you’re both okay. What is the purple plant growing everywhere in the photos? Just beautiful! Thank you! The purple plant is heather. It’s in bloom at the moment and just makes the common look even more beautiful than it already was!